Images & Details client Peter Fasano is known for designing and creating extraordinary hand-screened and hand blocked home textiles, but many designers have been unaware that Peter can collaborate with them to turn their vision into a one-of-a-kind custom fabric. 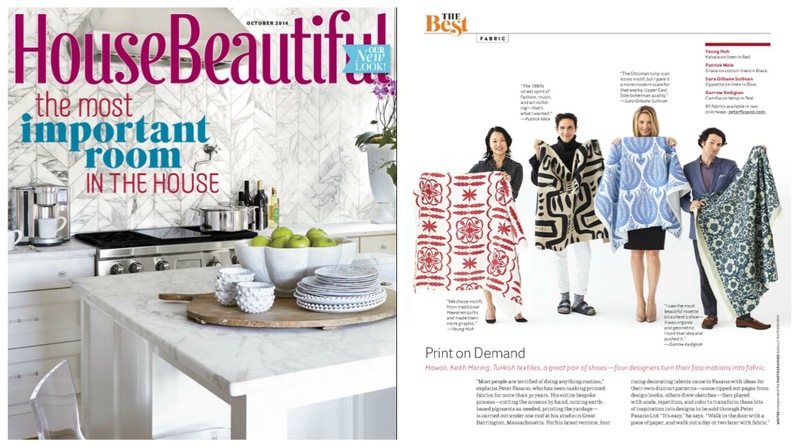 So we gathered four of the most inspired emerging designer stars in America, brought them to Peter’s studio in Great Barrington, Massachusetts, phoned our friend the talented editor Orli Ben-Dor, and the result is the striking and beautiful “The Best” column in this month’s House Beautiful magazine. These fabrics by Young Huh, Sarah Gilbane Sullivan, Patrick Mele and Garrow Kedigian are now offered in Peter’s line as well. We also tied in an event with designers at the D&D Building to launch the fabrics and spread the word to designers that any motif they’ve been wishing they could craft into fabric is now a possibility.